Can I let you in on a little secret? Mom + I might have been a teensy bit overwhelmed by all the bonus HST’s our Indian Hatchet Quilt yielded. So we thought about our options. And there were a lot of options. Should we lay them all out in one direction? Should we make pinwheels? Should we make an HST Squared Quilt? (Free pattern available for that one by the way. Just click here or subscribe next time you see a pop up). We opted to try something new. Something bright. And now we’d like you to meet our latest quilt: Windhaven. Windhaven is all about joy + fun, but let’s face it – Mom + I needed to use all those Bonus HST’s!! By the way, if you’re new to quilting, and are wondering what the heck “HST” means, it stands for Half Square Triangles. I too am not a fan of acronyms, but it’s what all the cool quilters call them. Despite the acronym, HST’s are so fun! You should definitely add them to your quilting arsenal. Our Windhaven Quilt Pattern is now available in our shop! Whoohoo! We walk you through all the steps to get you to HST Expert Status. You’ll definitely start thinking of HST’s in a new way – in a new “we’re besties for life” kind of way. Fabric Requirements for Baby, Throw, Twin, + Queen. A Coloring Sheet to help you choose your color palette. Easy to Read Piecing Instructions. Encouraging words from mom + me. We are cheering you on every step of the way! 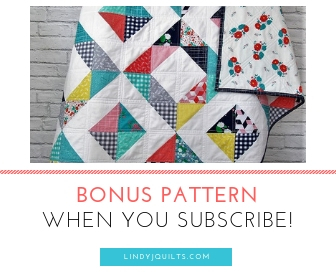 You can always grab a copy of our Indian Hatchet Quilt Pattern, but we’re of the opinion that since these 2 patterns go together like you + and that fabric addition of yours, we bundled up these 2 patterns at a special discounted rate. And yes, this one-of-a-kind cozy quilt is available in our shop! Skip all the production and grab it while it’s available. Makes a great gift! Just sayin’! So here are some particulars on the quilt. We used the HST’s from our Indian Hatchet to make Pinwheels that Spin. And since this quilt was pretty low-volume, we kicked up the color palette a notch or 2 with a bright (but not too bright) pink. White helped break things up a bit, don’t you think? oopsie, I spy a loose thread! Darn those things! We used a beautiful Art Gallery floral back called Pintemps Fusion, bound the quilt in the same pink, and quilted it with minimal ditch-quilting. Just the right amount of quilting. We’re loving all the options Windhaven can provide and we want to know: How would you play with this quilt pattern? How can you make it your own? Leave a comment below and tell us how you’d play with these colors! And now it’s time for us to get started on a new quilt. And this time we’re going bright + bold!